Speech by the Rt Hon Lord Owen to The Society of British Neurological Surgeons, Spring Meeting, Torquay. Friday 13th April, 2018. “In short, Hubris Syndrome is an identifiable change in personality, a trait rather than a disorder, occurring in individuals who occupy positions of power and influence. It is a syndrome of people who are not diagnosed as having any identifiable psychiatric condition. In that sense they can before they become powerful often be described as ‘normal’ and may have been chosen for their position of power by well-designed selection procedures, or elections. The onset of the syndrome bears some relationship to the time they have exercised power and in some cases the diagnostic signs and symptoms seem to ease with the passing of power. “The Greeks were very clear that hubris was a word describing a very unattractive feature in a person’s behaviour, often expressed in contempt for others. Contempt, when present in a person of power, is almost always a confirmation of hubris syndrome. “Bankers and businessmen, not just politicians, become susceptible collectively to what Keynes called ‘animal spirits’. Alan Greenspan, the former chairman of the US Federal Reserve Board, called it ‘irrational exuberance’ – note the word ‘irrational’. Yet booms and busts go with the territory of risk-taking capitalism: sweep it all aside and you are left merely with a bureaucracy. What is needed for capitalism to be tolerable in the 21st Century are specific solutions and greater sanctions, otherwise we can be certain that the ‘animal spirits’ will return. Greed, hubris and exuberance need to be kept in check. “There is a fascinating relationship between hubris and pathological gambling which we describe in the article in Brain to which I have referred earlier. (Owen and Davidson, 2009). 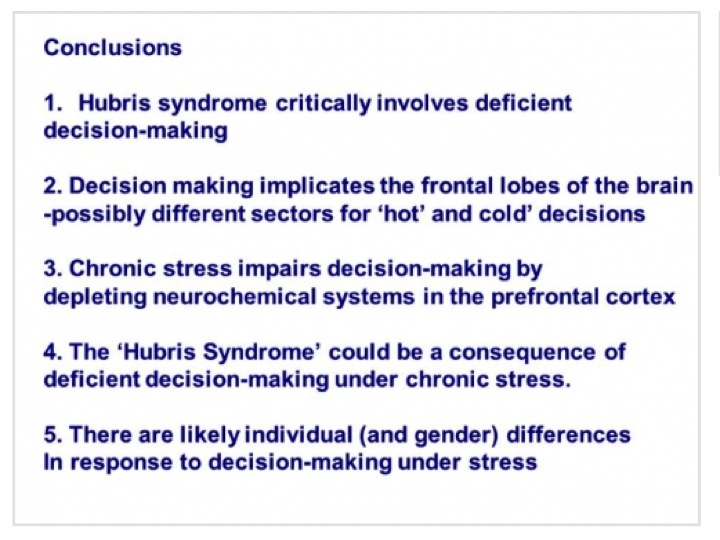 “The Somatic Marker Hypothesis (SMH) (Bechara and Damasio, 2005; Damasio, 1994) and the associated program of research (Dunn et al., 2006) provides physiological evidence for the visceral (‘gut feel’) affective responses in decision making under uncertainty and risk. 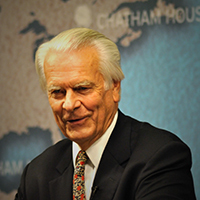 In 2009 in a lecture at the Institute of Neurology honouring the late David Marsden FRS, with whom I worked on beta-blockers at St Thomas’s Hospital Medical Unit from 1966-68, I suggested learning more about the hypothesis from studies about the secondary prevention of post-traumatic stress disorder, PTSD, and the immediate treatment with the beta-blocking drugs. The fact that after a long argument PTSD has been accepted as acquired has undoubtedly helped the claim that Hubris Syndrome is acquired. But we need more research in all of these areas. “A few years ago Professor Kapur, then Executive Dean of the Institute of Psychiatry, Psychology and Neuroscience, IoPNN, at King’s College London, drew to my attention a paper on the effects of a placebo induced dopamine release in Parkinson’s Disease (Lidstone et al, 2010). An article by Erik Vance (2014) in Discover magazine makes many things clearer in layman’s language about what Sarah Lidstone, who had led the brain-imaging experiment, had done and I describe this in some detail in the Foreword to The Intoxication of Power. Interdisciplinary Insights. “Is this cementing of expectations an explanation for how Hubris Syndrome appears to stay for months and years in someone who has acquired it but may recede when power is no longer being exercised? Hopefully in a decade we will have learnt much more about an in built brain mechanism that allows some of the powerful to acquire Hubris Syndrome but not others. I suspect that there is more than one mechanism that triggers Hubris Syndrome inside the brain. 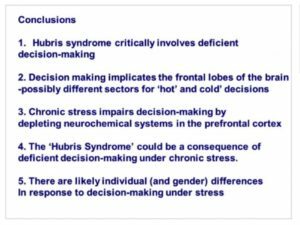 “In a public lecture entitled the ‘Neurobiology of decision making: gender and the exercise of power’, as part of a seminar at the Royal Society of Medicine on 9 May 2017, Professor Trevor Robbins (Robbins, 2017) of the University of Cambridge focused on confidence in judgements, excessive confidence, restlessness, recklessness and impulsiveness. We can all agree that important brain aspects of decision-making resides in the frontal lobes of the brain.